Innovation and product development have continued at the ICL Boulby mine in east Cleveland as it continues to reshape in order to meet future needs of agriculture worldwide. The improvement project relates to the development of PotashPluS TM a new granular fertilizer formulated using a combination of potash and fine particles of polyhalite. In order to ensure that the quality of the finished product is maintained it is necessary to apply a coating of a ‘wax’ type liquid within the new process. 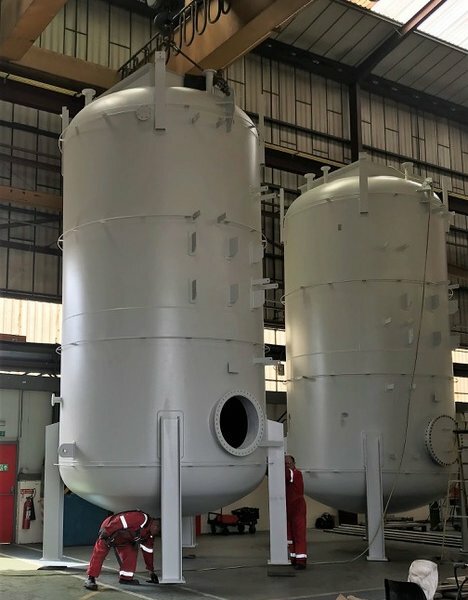 Francis Brown were contracted to supply two heat-insulated tanks to store the ‘wax’ compound. Including the legs these stand 7.3 metres tall and hold 42m3 of liquid at a controlled temperature of 90C. Among the Francis Brown project workforce were two young apprentices – Sam Shea who won the award for best City and Guilds Welding Student of 2018 in the Teesside area, and colleague Kieron Hutchinson. The tanks were transported to the site by Mammoet.